THIS BOOK GOT ME IN TO A LOT OF TROUBLE WITH SOUTHERN BELLE BECAUSE INSTEAD OF CUDDLING ON THE COUCH WITH HER I WAS READING THIS REALLY EXCITING BOOK. 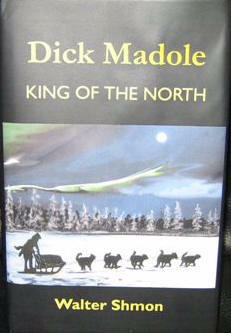 THE BOOK TELLS OF AN AMAZING FELLOW THAT COULD LIVE OFF THE LAND IN THE GREAT WHITE NORTH. PLUS DO A LITTLE PROSPECTING THAT FOUND THE 2 MINES THAT BUILT THE TOWNS OF SHERRIDON MB AND LYNN LAKE MB. BUT IN THE END HE GOT NOTHING FOR HIS EFFORTS BUT A MYSTERIOUS DEATH. THE BOOK KEPT ME ON THE EDGE OF MY SEAT AND UP LATE READING THE NEXT CHAPTER WHILE SOUTHERN BELLE WENT TO SLEEP KNOWING THEIR WOULD BE NO CUDDLING UNTIL THE BOOK I WAS READING WAS FINISHED. SINCE THE BOOK WAS JUST RELEASED IN 2005 IT WILL BE HARD TO FIND SO JUST EMAIL ME AND I'LL GET YOU A COPY.